ItemI-33511 - Survey boat wrecked on the Finlay River. ItemI-33737 - "Axel Spongberg's logging camp - Gardner Canal." 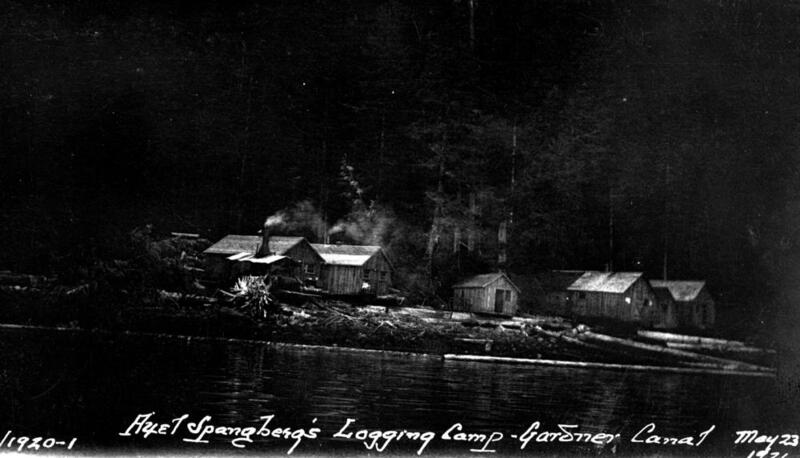 ItemI-33738 - Spongberg's logging camp; Gardner Inlet. ItemI-33739 - "Kitlope to Prince Rupert"; skiff used for the trip. ItemI-33740 - Indian village at the mouth of the Kitlope River. ItemI-33741 - Totem pole in the village at the mouth of the Kitlope River. Item I-33737 - "Axel Spongberg's logging camp - Gardner Canal." "Axel Spongberg's logging camp - Gardner Canal."